You can take antibiotic acne medications (mainly Tetracycline and Minocycline) that mainly work by decreasing inflammation and fighting bacteria ?€“ a very partial and destructive solution that works short term. You can take Adapalene - an acne medication that helps control acne and prevent breakouts, but works short term and can result in nasty side effects or you can take acne steroids or Accutane: a very strong acne medication (form of Vitamin A) prescribed only in severe cases on acne, infamous fro its serious and side effects. 1.Significantly damage your internal system and destroy your natural internal balance. 2.Will not cure your acne or prevent/fix the ‘environment’ responsible for acne formation. 3.Make your acne and your health worse in the long run. Steroids are aiming at reducing inflammation caused by acne. In the process steroids, place significant stress on your liver. By stressing your liver, steroids, severely damage your internal system, the delicate foundation responsible for ensuring lasting acne free skin. Antibiotic acne medications like tetracycline aggravate your acne in the long run and also severely damage your internal system in the process. All antibiotics are basically aimed at killing the acne bacteria found in your system. Now, we already know that killing the bacteria will not cure your acne and we also know that we need these bacteria for many good reasons such as skin flexibility. But the most horrifying aspect of it all is that antibiotics not only kill the acne bacteria- antibiotics, like a nuclear bomb, destroy ALL the bacteria in your system, including the good,probiotics bacteria like acidophilus that have many essential qualities which promote clear skin. One of these qualities is the ability to protect your digestive tract from parasites and fungus (that constantly stress and damage your liver, one of the most important organs responsible for maintaining healthy acne free skin). Whatever you do, don't become a victim to the acne medications trap. 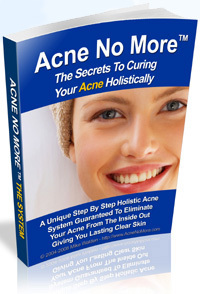 Don't sacrifice your acne and your health for a quick fix that doesn't work. There are excellent alternative treatments fro acne without paying the costs and enduring the side effects of acne medications.